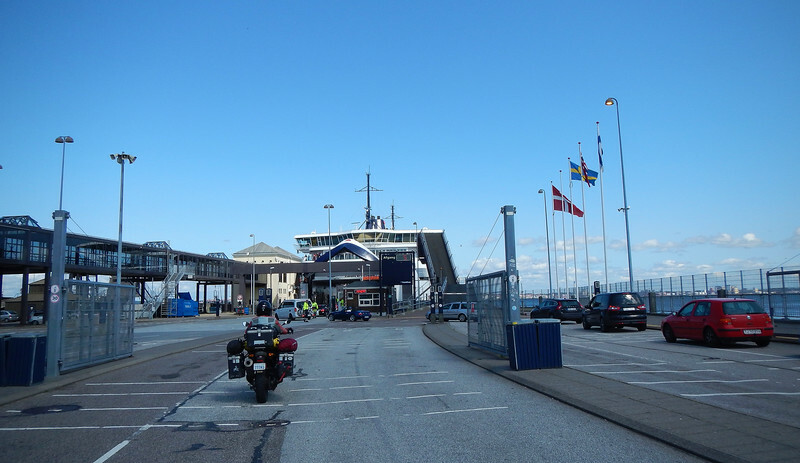 We left Denmark on a ferry going from Helsingør, DK (just north of Copenhagen) to Helsingborg, Sweden. Looking back at the map, there seemed to be a long bridge just outside Copenhagen that led to Malmö, but our GPSes picked the shorter route via the ferry. 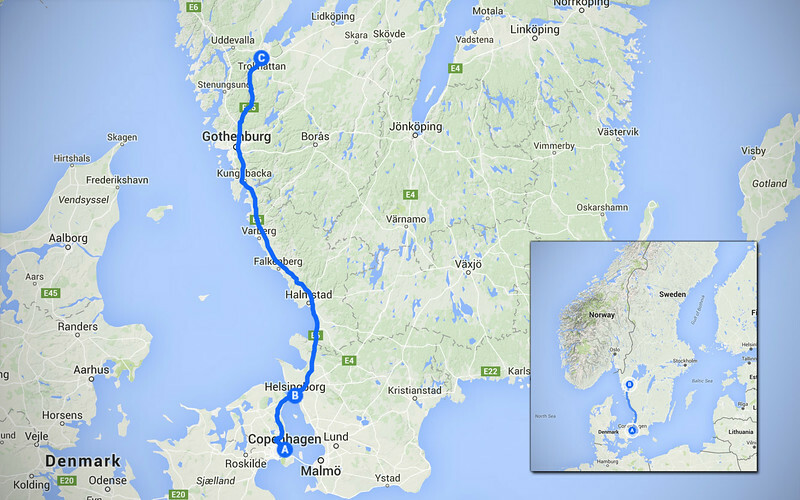 It turns out the 8 km long Øresund Bridge has a €25 toll, which is more expensive than the €21 ferry. So just by chance, we got the cheaper and shorter route! Boarding the ferry at Helsingør. I love the funny-looking letter ø. It looks like a zero. No idea how it's actually pronounced, but it's more fun saying Helsing-Zeroar! 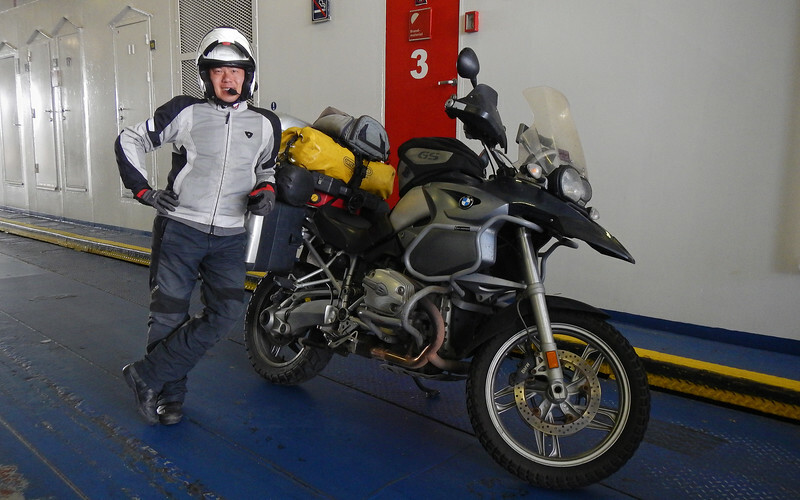 Hanging out on the Heingsør ferry with my R12ØØGS møtørcycle. Cøøl! On the ferry, we saw tons of people lugging cases of beer on the ferry to Sweden. We found out later that while Sweden is generally cheaper than Denmark, one of the few things that cost less in Denmark is beer. A bottle of beer costs almost three times more in Sweden than Denmark!!! So strange! That's Sweden over there, land of expensive beer. 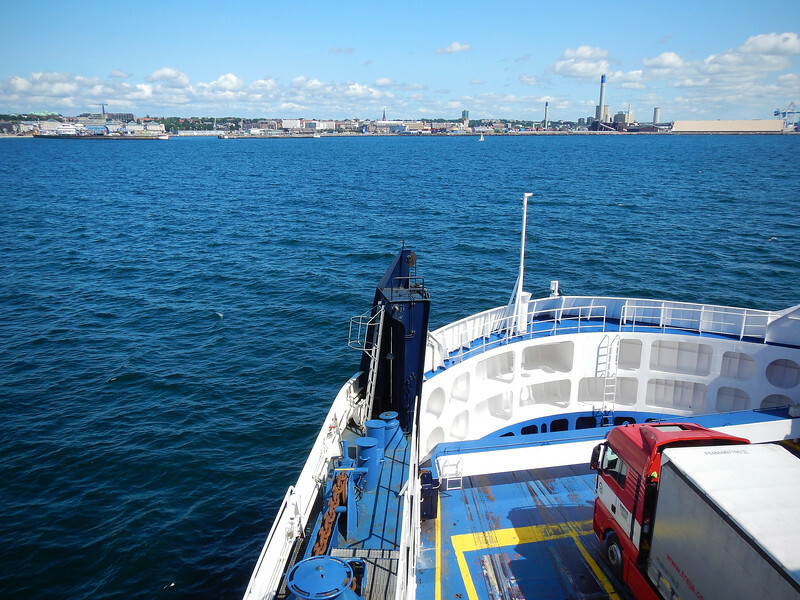 The ferry lets us off in Helsingborg. 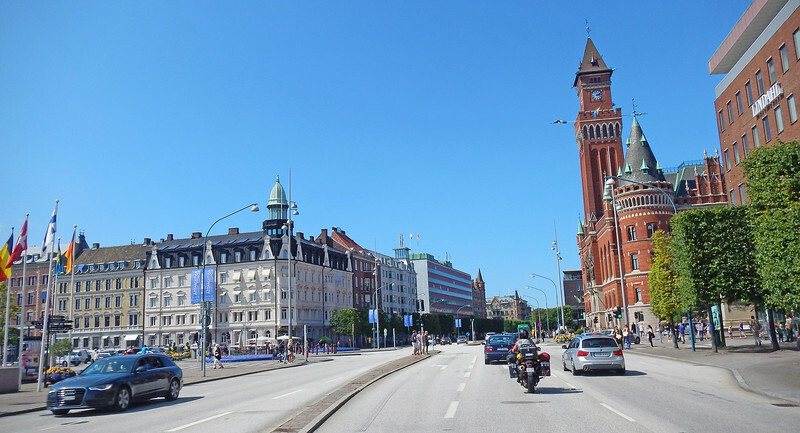 One of the first things we see is the Helsingborg Castle (on the right). 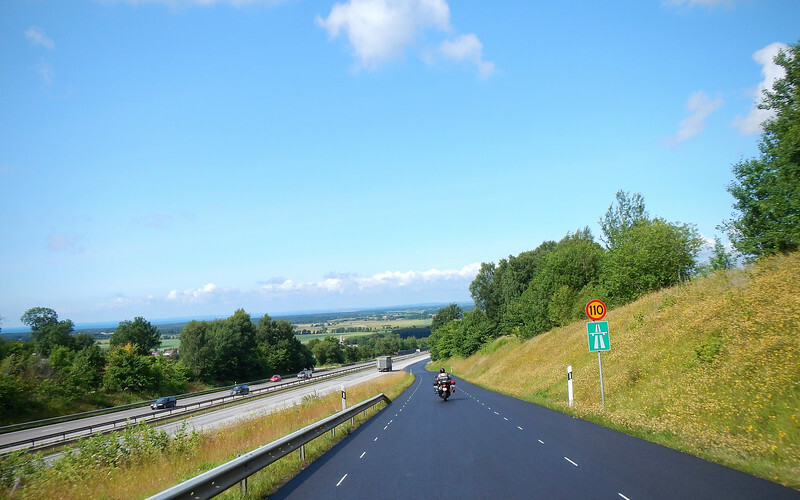 We rode along the western coast of Sweden, along the Kattegat Sea, which is the bay of the North Sea bounded by Denmark, Sweden and Norway. 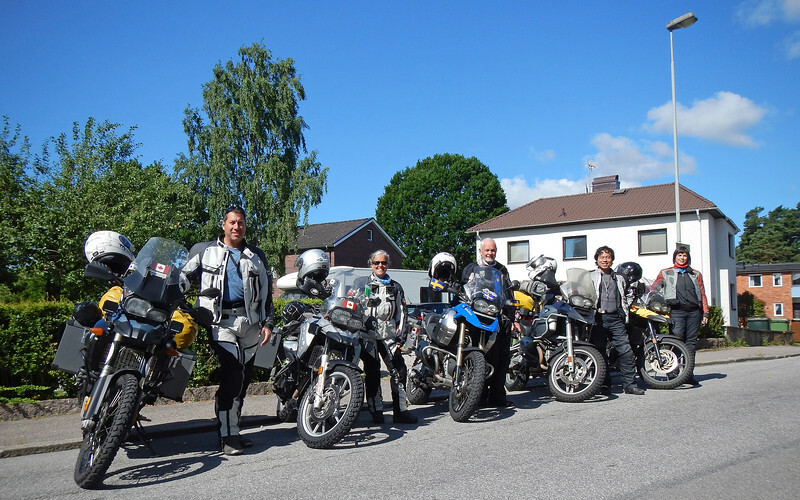 We are on a bit of a schedule because we are having a mini motorcycle traveler meeting in Trollhättan, about 3 hours north of Helsingborg. Are we in Sweden... or Northern Ontario...? I didn't take a lot of pictures on our ride up the coastline. Mostly because I was leading, but mainly because the boreal forest here is so reminiscent of Northern Ontario that there didn't seem to be anything new or exciting to take pictures of. 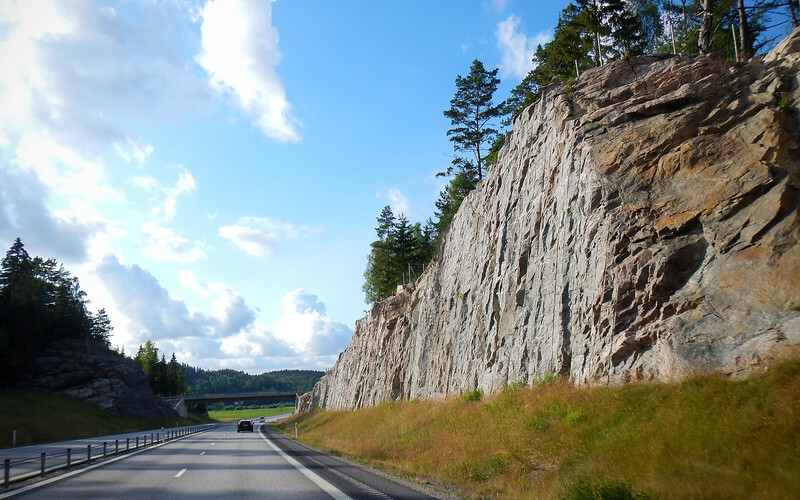 What completed the illusion are the large exposed sections of rocks that we ride pass, obviously dynamited to make way for the road, just like back home. By comparison, this is a picture of Lake Superior National Park in Ontario taken on one of our trips a few years ago. So similar! 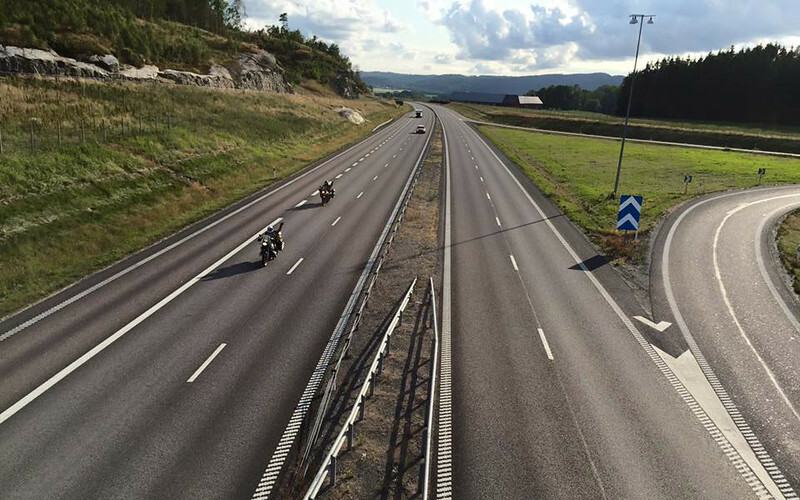 Just outside of Trollhättan, we saw a couple of motorcyclists on an overpass waving at us. We knew Sara and Daniel from World Wide Ride were meeting us here, but these guys were only on a single blue bike that wasn't familiar looking. But being friendly Canadian bikers, we waved to them anyway. The motorcyclists caught up to us by the time we got into town. It was our Swedish friend, Orvar on his newly painted blue R1200GS and Sara was in the passenger seat taking pictures and videos of us! We met Orvar on the Stahlratte, on our second sailing from Panama to Colombia. It's always a treat to hear about other travelers talk about their home town and then be able to see it for yourself. We were planning on visiting Orvar on our trip up north, but when he told us that Sara and Daniel were also at his place right now, we made an extra effort to catch up to them. 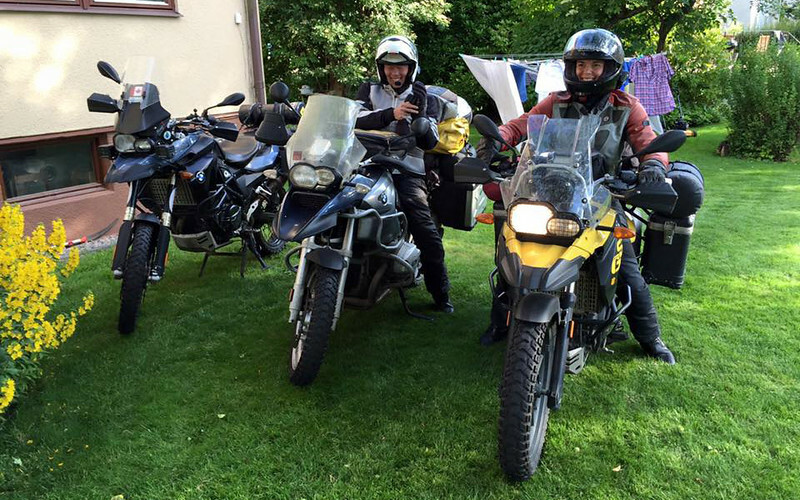 Sara and Daniel are another motorcycling couple from British Columbia, Canada, also on two bikes. They left around the same time as we did, but travel a lot faster than we do. Then again, most people travel faster than we do. We have a lot of mutual friends - the RTW moto-circle isn't that large, and with social media, it's so easy to connect with each other. We've almost crossed paths with Sara and Daniel so many times in the last three years, but now we're finally able to meet them! So apparently Orvar's nickname is "King of Sweden". He's never actually called himself that, but everyone we meet tells us so. He took us grocery shopping and walking around town and *everybody* knew Orvar and his motorcycling exploits around the world. Daniel convinced me to not be so cheap and to change out my balding rear tire. I think I really needed an impartial third-party opinion otherwise there'd be another Czech-Republic-Roadside-Moto-Emergency further north. So we hopped into Orvar's car with my wheel and got a Michelin Anakee 2 mounted. We're probably not going to be doing as many off-road routes in Europe, so I decided to go with a 90/10 tire instead of the Heidenau 50/50s. I've always been a Tourance guy, so it'll be interesting to see how the Michelins stack up to Metzelers. We are going to be big stars in Trollhättan! Sara is holding the Canadian flag for the interview! 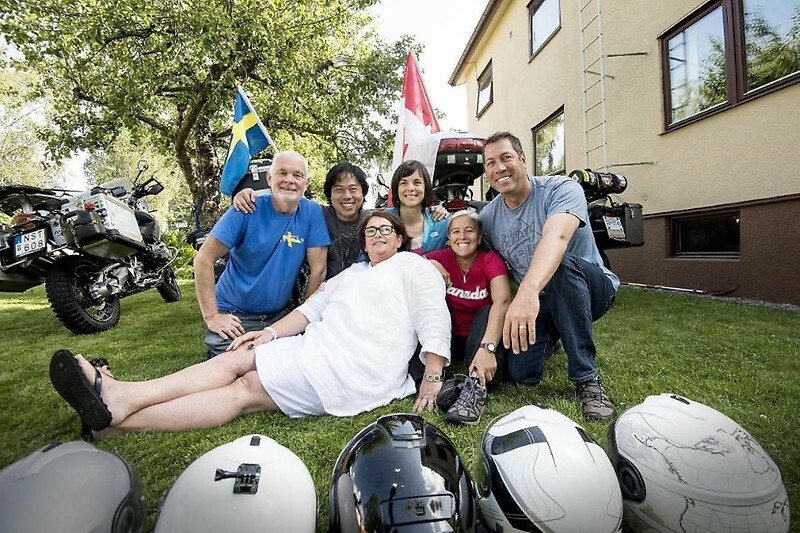 The King of Sweden has many friends in the media, and they were very interested in doing a story on the four Canadian motorcycle travelers that were nesting in Trollhättan, Sweden. So one morning, they sent in a reporter and a photographer and we had a great time telling tall tales of our adventures and exploits. 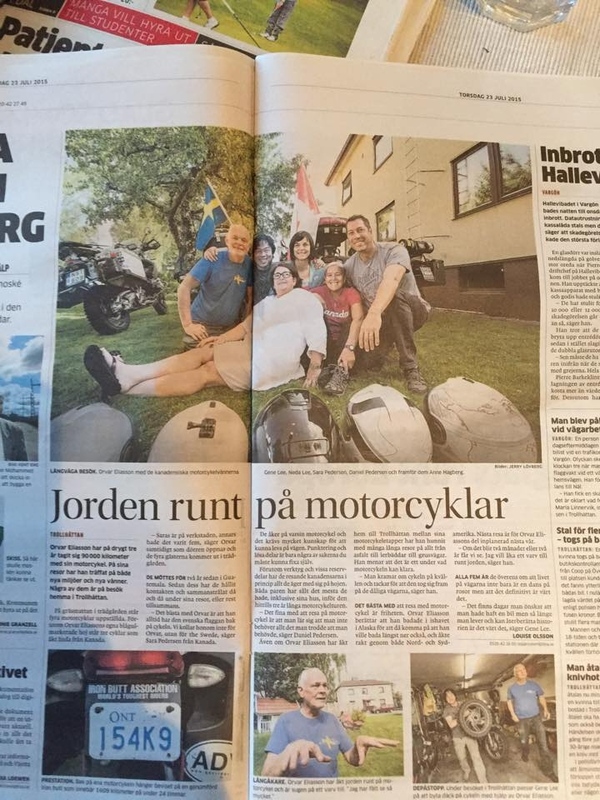 Orvar used to own a restaurant in town and now in his retirement he keeps himself busy by traveling the world on a motorcycle and when he's back at home, he occupies his time by driving a bus and volunteering at a refugee centre just outside of Trollhättan. A lot of refugees from the Middle East come to Sweden and are processed here before they get assigned homes all over the country. I found out that of the 50,000 people that live in Trollhättan, one in four have an immigrant background. 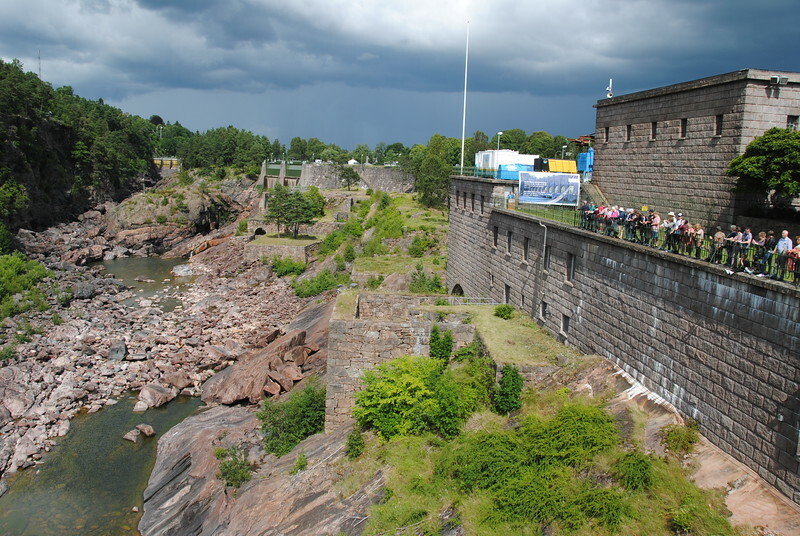 Trollhattan has a man-made dam that they release the water a few times every day in the summer to create an artificial waterfall. Three doors open to let 300,000 liters of water into the gorge below to the delight of visitors watching from above. There are hydro-electric dams further down the coasts that actually use the flowing water to generate power, but this one is just for the tourists during the summer. While Orvar was out volunteering, his wife Anne drove the four Canadians around town showing us the sites. Trollhättan is a quaint town that reminded me of Huntsville, another quaint town in Northern Ontario. And what was more fascinating was walking around in this Canadian facsimile town talking to fellow Canadians Sara and Daniel. They have such similar backgrounds to us that it was like talking to mirror images of Neda and I.
Dan and I were engrossed in the topic of vehicle insurance in Canada and for a while I completely forgot that I was in Sweden, on the other side of the world from our home country. Everything that they remarked on I thought to myself, "Wow, I was *JUST* about to say the same thing!" It was so eerie meeting people with such similar cultural backgrounds from us, transplanted in another place and having the same reactions to things around us. We used to go motorcycling in an area north of Toronto called the Muskokas. The Trent-Severn waterway runs through there and goes through several locks on it's way east through Ontario. 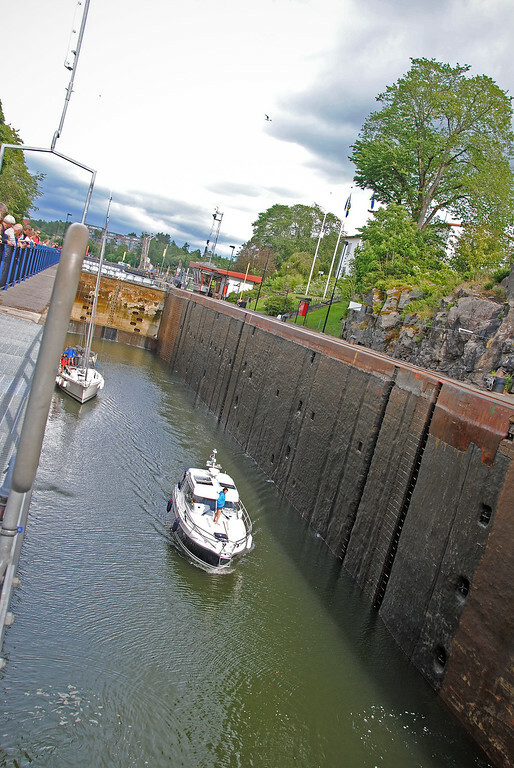 The Trollhatte Kanal really reminded me of the locks in Port Carling, Ontario. And they speak English here with a funny accent. Just like people in Northern Ontario do, eh? And you know what? They even have Ikea stores here in Sweden, just like in Canada! There was a classic car meet near the Trollhatte Kanal. 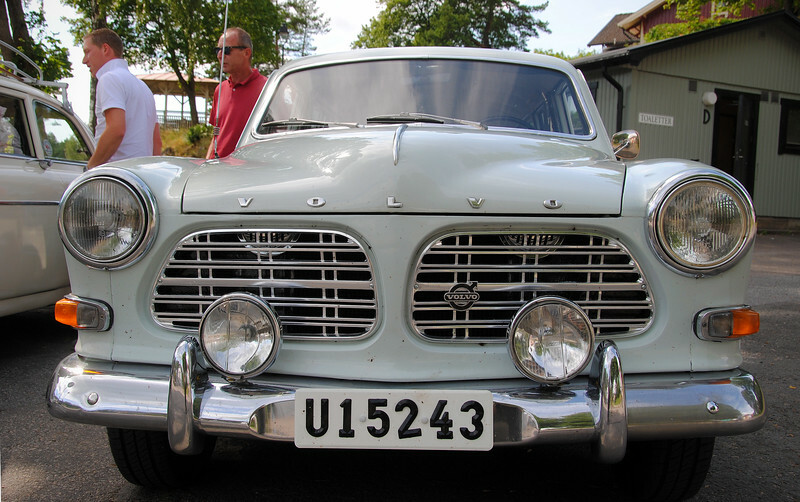 Instead of old Chevies and Fords, there were these swede-looking vintage Volvos! All suited up and ready to head to Norway! Sara and Daniel were ready to leave the small town of Northern Ontario, Sweden the same time as we were, so we're all going to travel together for a little while, with the King of Sweden leading us out of his country! It'll be nice to have company for a change! And with fellow Canucks too!